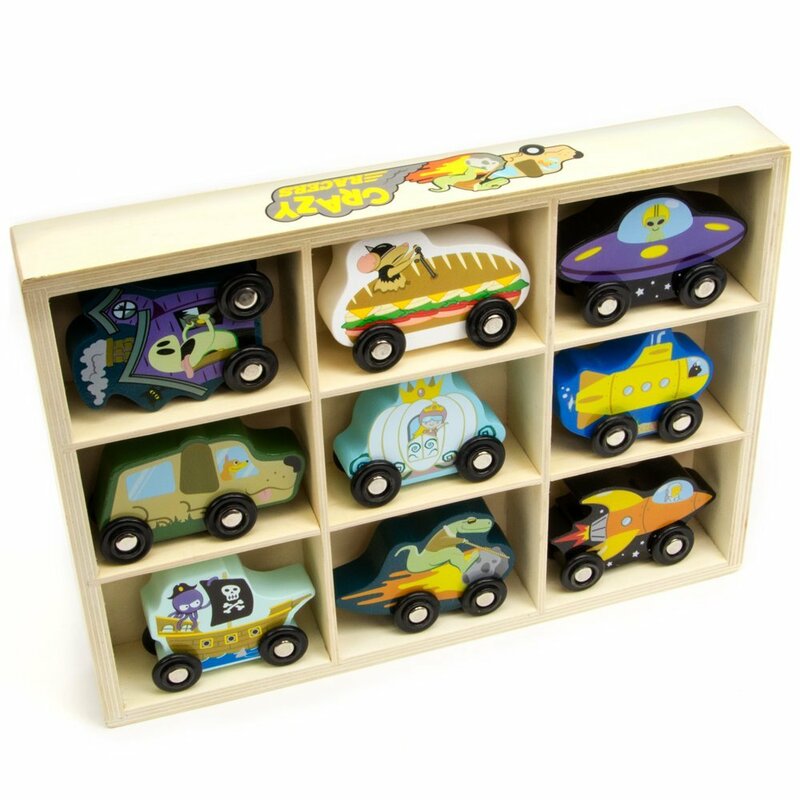 Wooden Wheels begin as blocks of natural beech wood, which are cut and crafted into one of our 8 big, chunky vehicles! We use low friction metal axles for easy rollin', and each piece of wood is securely fastened to stand up to even the toughest play. 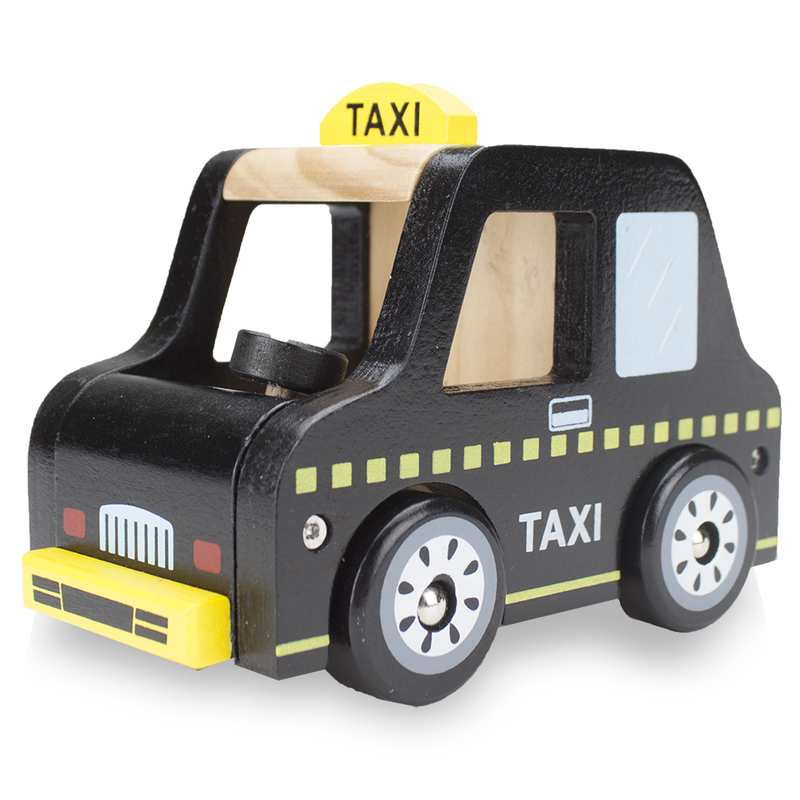 The Taxi Cab is painted sleek, urban black with lots of tiny details, like door handles, headlights, and a yellow roof lamp so busy people can hail the taxi! This big, chunky wooden taxi cab is approx. 5.5" long, 4" tall, and 3.2" wide. Wooden Wheels begin as blocks of natural beech wood, which are cut and crafted into one of our 8 big, chunky vehicles! We use low friction metal axles for easy rollin', and each piece of wood is securely fastened to stand up to even the toughest play. 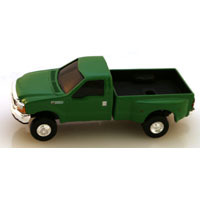 The Pickup Truck is painted bright green with lots of tiny details, like step ladders, door handles and a big grill. 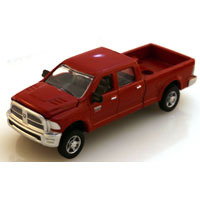 It even has a flat storage bed for transporting all sorts of stuff! This big, chunky wooden pickup truck is approx. 5.5" long, 4.25" tall, and 4" wide. 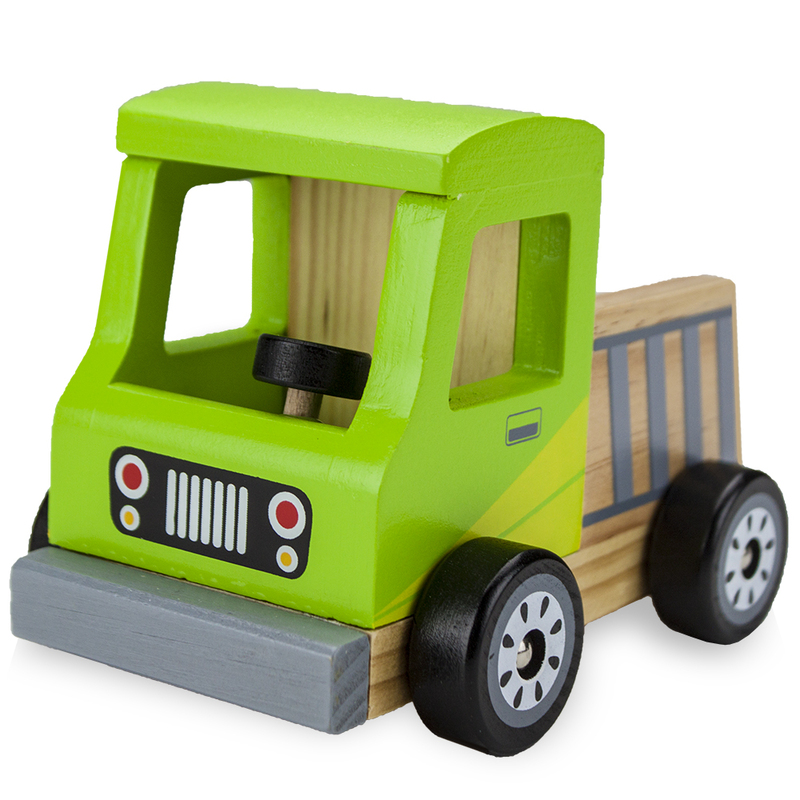 Wooden Wheels begin as blocks of natural beech wood, which are cut and crafted into one of our 8 big, chunky vehicles! We use low friction metal axles for easy rollin', and each piece of wood is securely fastened to stand up to even the toughest play. 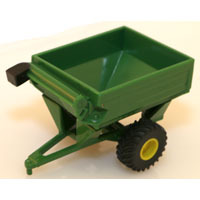 The Cement Mixer is painted orange and blue with lots of little details, like a bumper, a grill, and headlights. It even has a mixing barrel that really rolls! This big, chunky wooden cement mixer is approx. 5.5" long, 4.25" tall, and 4" wide. Wooden Wheels begin as blocks of natural beech wood, which are cut and crafted into one of our 8 big, chunky vehicles! We use low friction metal axles for easy rollin', and each piece of wood is securely fastened to stand up to even the toughest play. 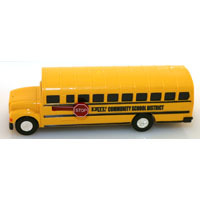 The School Bus is painted a cheery yellow with lots of tiny details, like little riders and safety stop signs. 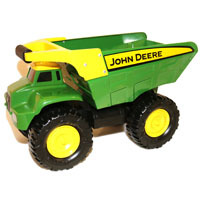 It even has a hatchback that opens up to give your other toys a ride! 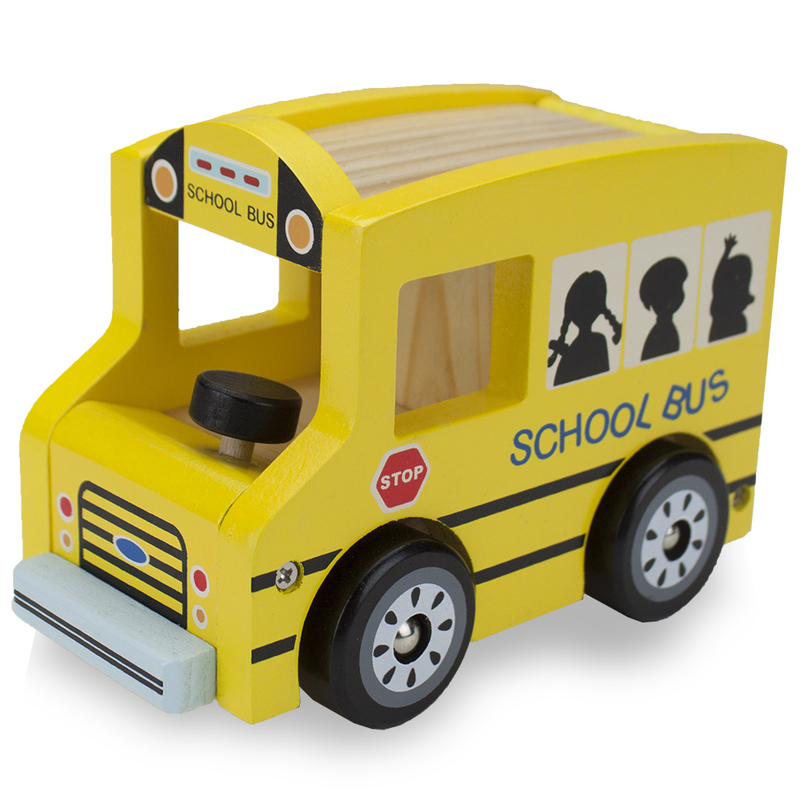 This big, chunky wooden school bus is approx. 5.5" long, 4" tall, and 3.25" wide. 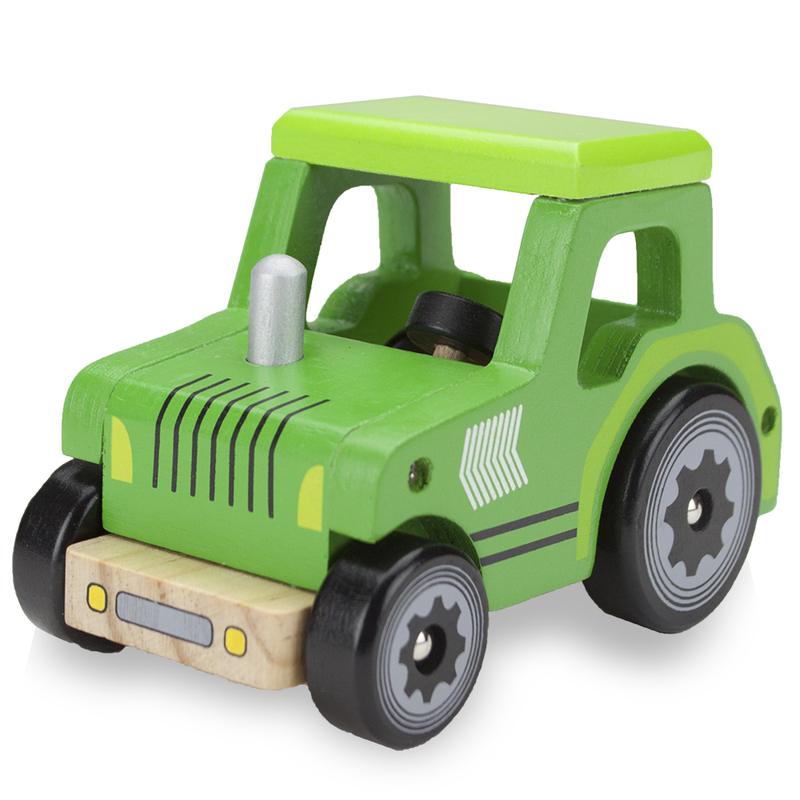 Wooden Wheels begin as blocks of natural beech wood, which are cut and crafted into one of our 8 big, chunky vehicles! We use low friction metal axles for easy rollin', and each piece of wood is securely fastened to stand up to even the toughest play. 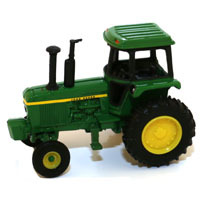 The Tractor is painted an earthy green with lots of tiny details, like a gray exhaust pipe and the big back wheels real tractors use for extra torque! 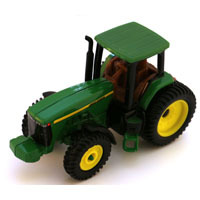 This big, chunky wooden tractor is approx. 5.75" long, 4" tall, and 3" wide. Put on your hard hat and let's get to work! 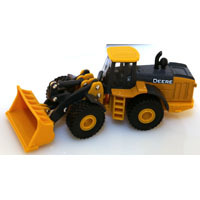 Drive your construction vehicles, move heavy items, and take care of business! 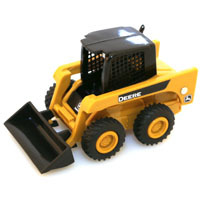 With your sturdy steam roller and bulldozer, you have all the tools you need to finish the job. 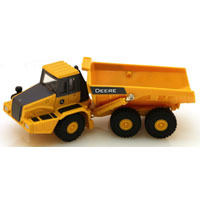 Load up your equipment on the carrier truck and make your way to the construction site! 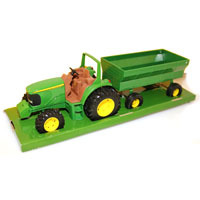 Develop fine motor skills, spatial awareness, and imaginative play with this solid wooden truck set. Made from natural wood and decorated with water-based paint. 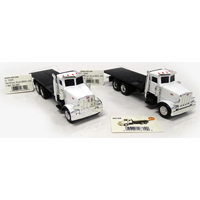 These three Tough Trucks are all kinds of interactive! 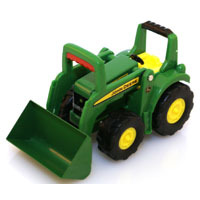 Un-hitch the trailer and lift the loading ramp, lift the steam roller, then lift and dump the bulldozer's shovel. 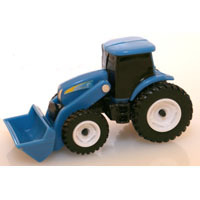 Each little activity is a big source of development for fine-motor skills and manual dexterity. 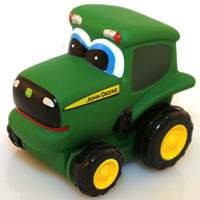 Made from natural cuts of wood, these traditional toys are simple but enriching and play very nicely with wooden trains and cars. 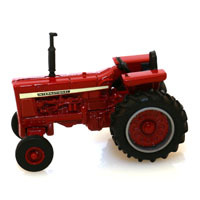 Sturdy, simple, and traditional, wood block toy cars are a staple children's toy, but that doesn't mean they all have to look the same! Meet the Crazy Racers: a set of nine kooky speed demons driving all sorts of wacky improvised vehicles. 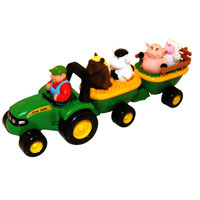 Of course, they'd really like to zoom on a race track, but they're sized to play well with all sorts of kids toys: standard wooden mini vehicles and play rugs and play mats, and they fit most brands of wooden train tracks. 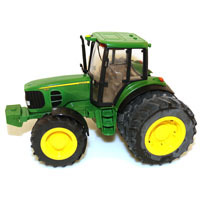 Everything great about traditional wooden toy cars, just a little cooler! 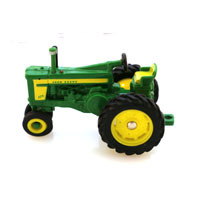 Cut from natural blocks of solid wood and finished with water-based paint, these classic toys supercharge fine motor skills and encourage imaginative play and a healthy sense of adventure. Riding the Nasty Asteroid, this dinosaur is dino-mite on straightaways! Turning is another problem. Riding the Magic Pumpkin, this pretty princess must be in the winner's circle before midnight. Riding Calamari's Revenge, this Octopus pirate lost one of her eight legs, but never lost a race! Riding the Haunted Motor Home, this spooky ghost sends his competition home boo-hooing. Riding the Endeavor space shuttle, which tops out at about 17,500 miles per hour! Riding the UFO (unbelievably fast object), this alien explorer has no relation to any other Marvins from Mars. Riding the Waggin' Wagon, this corgi is the fastest fetcher known to man. Riding the Footlong Special, this mouse with attitude insists on being called the "Road Warrior." Riding the US Bengal, this kitty cat is the most decorated/only feline naval explorer. VROOM! Race your way down the four-level track to cross the bricks at the finish line! With its 3 speedy cars, sponsor logos, and bricks at the finish line, this zig-zagging race ramp is designed to bring out the racing spirit. 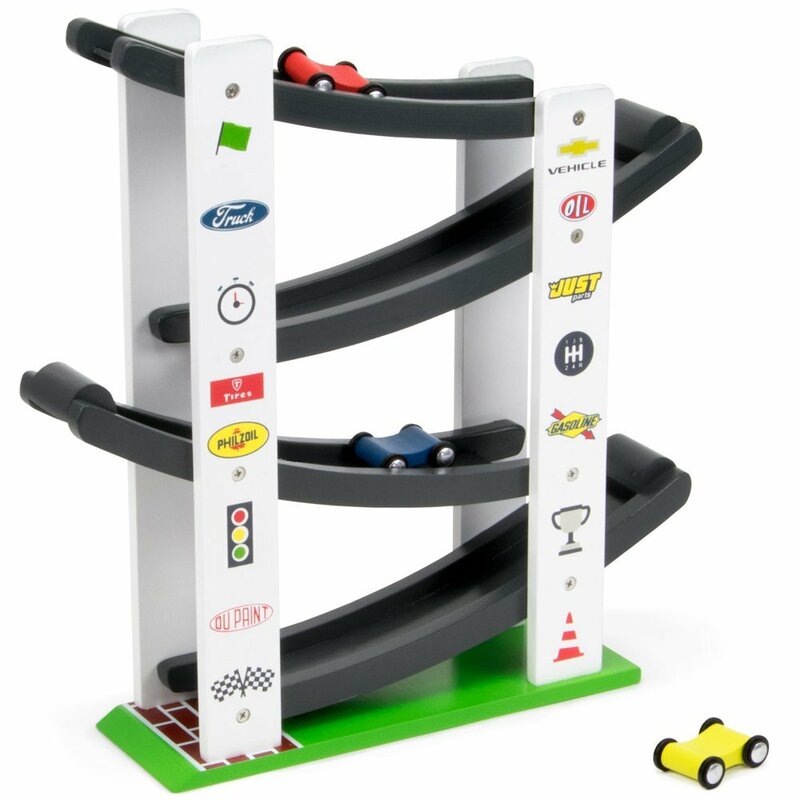 This ramp tower is a wonderful way to introduce little drivers to the world of racing. It's made from natural wood and designed with water-based safe paints, this ramp is built to last and environmentally friendly. It develops fine motor skills, spatial recognition, and important social and emotional skills such as sharing, playing with others, and taking turns. Our race ramp comes with three cars and is fully built to have you racing right out of the box. It has uniquely designed logos based on famous racing sponsors down the sides, bringing out the racing spirit. 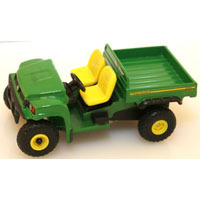 This ramp is compatible with other four-wheeled racing toys and is perfect for any young racing fan! Wooden Wheels begin as blocks of natural beech wood, which are cut and crafted into one of our 8 big, chunky vehicles! We use low friction metal axles for easy rollin', and each piece of wood is securely fastened to stand up to even the toughest play. The Ambulance is painted bright white and blue with lots of tiny details, like a hospital logo and classic red and blue flashing lights. 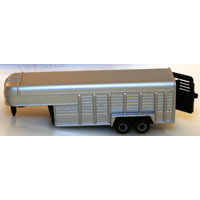 It even has a hatchback that opens up to get care for sick people in a flash! 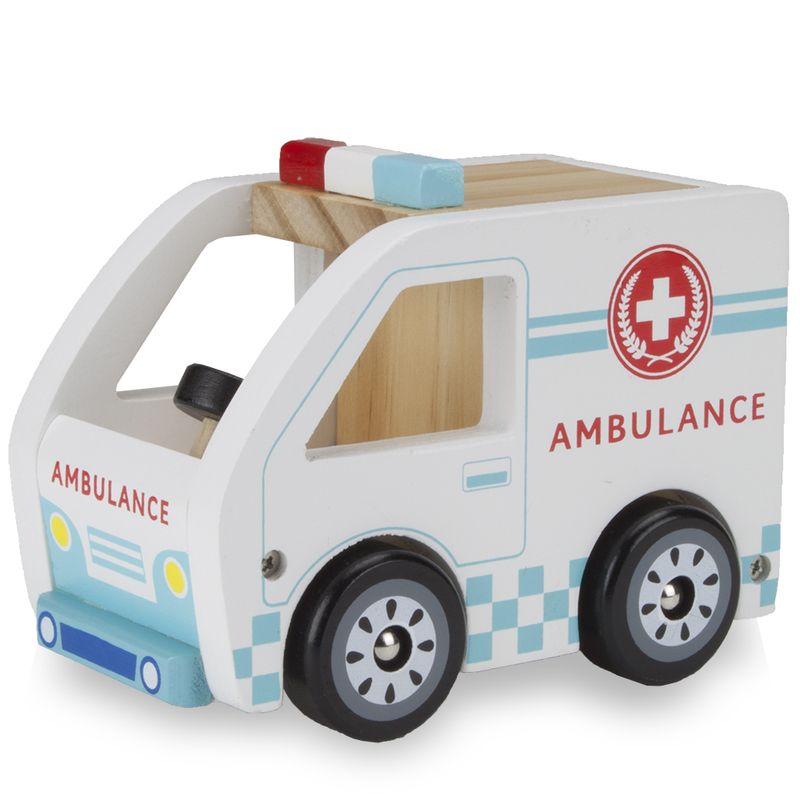 This big, chunky wooden ambulance is approx. 5.25" long, 4" tall, and 3.25" wide. 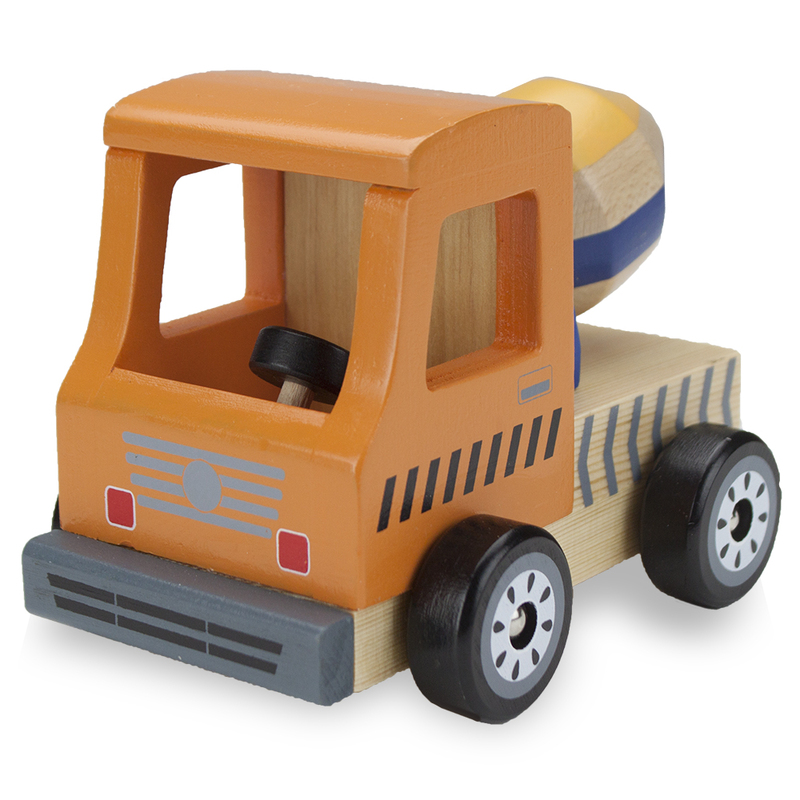 Wooden Wheels begin as blocks of natural beech wood, which are cut and crafted into one of our 8 big, chunky vehicles! 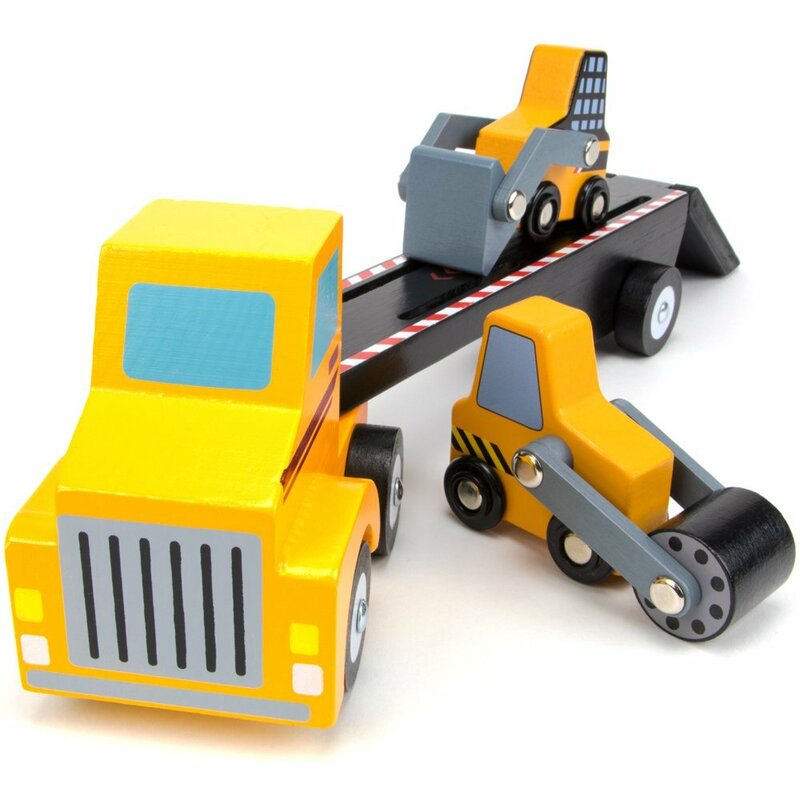 We use low friction metal axles for easy rollin', and each piece of wood is securely fastened to stand up to even the toughest play. 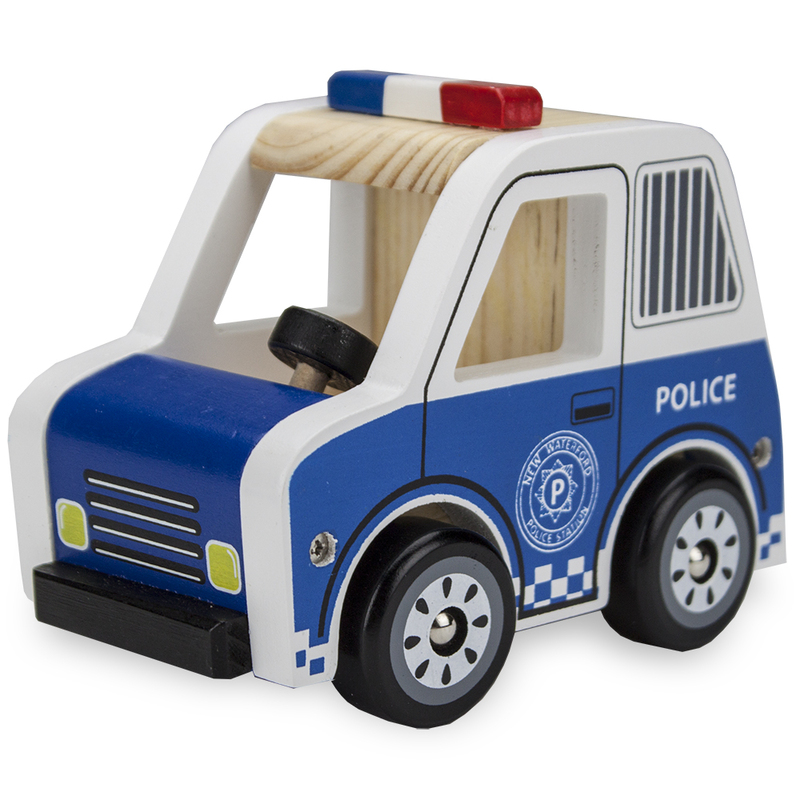 The Police Cruiser is painted bright blue and white with lots of tiny details, like a barred backseat window for crooks, and those classic red and blue flashing lights This big, chunky wooden police cruiser is approx. 5.25" long, 4.25" tall, and 3.25" wide.